You may be familiar with this term used to describe the overuse of social media by parents to share content based on their children. There is an ongoing debate as to how parents can balance their right to share, with their child's interest in privacy. Paediatricians are starting to consider how sharenting affects childhood wellbeing and family life. The BBC released an article about sharenting putting the young at risk of online fraud and identify theft through making their children "fraud targets" in the future, by publishing so much personal information which will remain online – the full article can be read here. If you have children of a certain age then you will have heard them talking about the latest video gaming craze called Fortnite. Chances are, if they're not playing on it, they'll have a friend who is. The popular strategy survival game is played on PlayStation 4, Xbox One, Windows, and Mac and combines Minecraft resource collecting and building with team based survival shooting games. It’s become super popular via its free-to-play Battle Royale mode where hundreds of strangers go head to head in a gun battle until only one man or team is left standing. But it's having some unwelcome side effects on family life, not least because once children are on it, they don't want to come off it . Fortnite is currently at a 12+ certificate for frequent scenes of mild violence. It is not suitable for persons under 12 years of age. Not covered by ratings are the interactions with other players online. Although the game isn’t rated for profanity, its online nature could expose younger players to offensive language from random strangers via the voice or on-screen text chat. It’s also a game where the sound is crucial (hearing footsteps of other players in particular). This means that players will wear headphones and parents can’t always hear what is being said by strangers. Because of this it’s worth setting up your console or PC to have sound coming from the TV as well as headset so you can hear what other players are saying to your children from time to time. 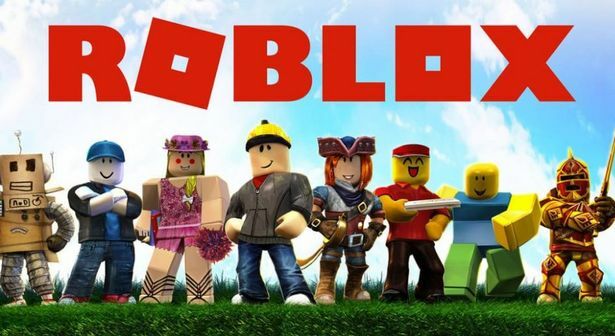 A primary school has warned parents about the online gaming app, Roblox. Bredhurst Primary School, in Kent, sent a letter to parents on Friday after concerns were raised about children talking to strangers through the app, and receiving inappropriate messages with characters doing "very adult things" in the virtual world. 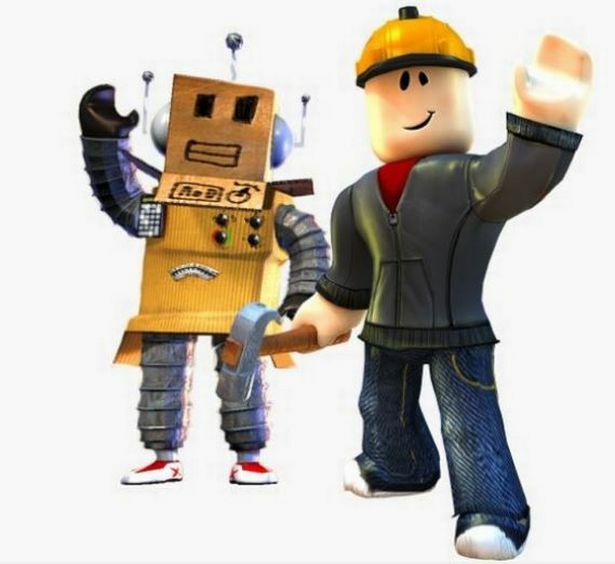 Roblox has more than 30 million players and enables children aged between 8 and 12 to create their own games and play in "virtual worlds". The letter went viral – attracting 2,700 comments and 45,000 shares – after it was posted on Facebook. The letter states: "Many of the children stated they had received many in-game messages from ‘strangers’ and that they hadn’t told their parents. All of the children then stated that they had seen ‘naked’ characters walking around the game and that the characters were doing very adult things." Although the letter claims that the warning against the app comes directly from the Kent Police, it was later confirmed that, in fact, it was from EST eSafety Campaign. Bredhurst's headteacher Michelle Cox said: " I sent a letter out to the parents of the children within my school as I had been sent information regarding the app Roblox. I had thought at the time that the information came from Kent Police, however, after issuing this advice letter, I discovered that the original warning had not come from Kent Police but from an online e-safety company (EST) and was based upon their findings having attended a primary school. 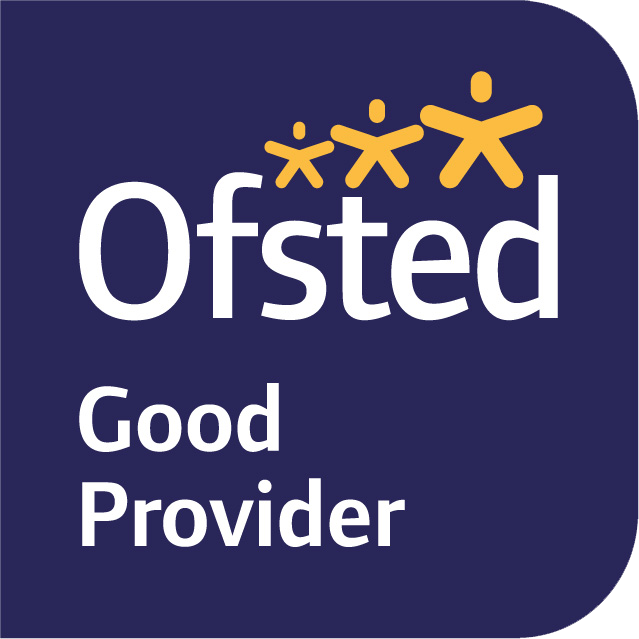 "As a school, before I sent the letter, we spoke to the children within our school to gauge whether this was an app that the children were using and whether they were using it safely. We discovered that at least 80 per cent of our pupils were indeed playing this game online and approx. 80 per cent of these pupils had online friends they did not actually know. Some even admitted that their accounts were ‘maxed out’ meaning they had in excess of 200 online friends. As a result of this, we decided that we needed to inform our parents of the information we had received to ensure that our children were kept safe whilst on line. "I apologise that my initial letter was misleading regarding coming from Kent Police, but I stand by the basic message in my letter. "Safeguarding of our pupils is of the utmost importance and online safety is a major part of that." A spokesman for Roblox said: "While we applaud the precautions of the head teacher at Bredhurst C.E. Primary school, her letter is based on false and misleading facts from an online safety site blog post that was first published in October, 2017. All games on Roblox must comply with our Rules of Conduct. Our safety team reviews every uploaded image, video, and audio file used within our games to make sure they are safe and age appropriate. It has been brought to our notice that a number of children are playing games at home that are not suitable for their age group. Please check the PEGI rating of all games used. Some of the content of these games are really not suitable. For more information about PEGI ratings please follow the link. Keep your computer in a shared area. If possible, set up your computer in a shared area at home so that you monitor your child’s access to the Internet. Talk to your child about what they’re up to online. Be a part of their online life and show an interest. Find out what sites they visit and what they like about them. By taking an interest in what they do online they are more likely to come to you if they have any issues. Set boundaries in the online world just as you would in the real world. Think about what they might see, what they share, who they talk to and how long they spend online. Discuss boundaries at a young age to develop the tools and skills children need to enjoy their time online. Know what connects to the Internet. Today many household devices can connect to the Internet. Make sure that you are aware of all the devices that your child uses connect to the Internet, such as their phone or games console. Use parental controls on all devices that link to the Internet. Parental controls are tools to help you set appropriate boundaries as your child grows and develops. Service providers are working to make them simple, effective and user friendly. You should speak to your provider to find out further details (see the links below). Make sure that you know how your children are accessing the Internet – is it your connection, or someone else’s wifi? This will affect whether the parental controls that you set are being applied. Social Networking Sites. Many of these sites have a minimum age limit of 13, so our pupils should not be accessing them. Visit online safety websites. There are lots of useful online safety sites for parents, carers and children online. They are great fun to explore, and many contain videos and games designed to educate children about how to stay safe. Links to a few key sites are listed below. We know that children, particularly younger children, can be bothered by things that they see online, and filters can be a helpful tool in reducing the chances of coming across something upsetting. We use filtering in school to help prevent your child from accessing age inappropriate material. The 4 big Internet providers in the UK – BT, Sky, TalkTalk and Virgin Media - provide their customers with free parental controls, which can be activated at any time to help prevent access to age inappropriate material on your computers at home. The link below will take you to the Safer Internet website where helpful video guides show you how to download and set-up the controls offered by your provider. You can also find out about parental controls and safety features of many other popular Internet services. Remember that filtering is only part of the solution. No filter or parental controls tool is 100% effective, and many of the risks that young people face online are because of their own and other’s behaviour. 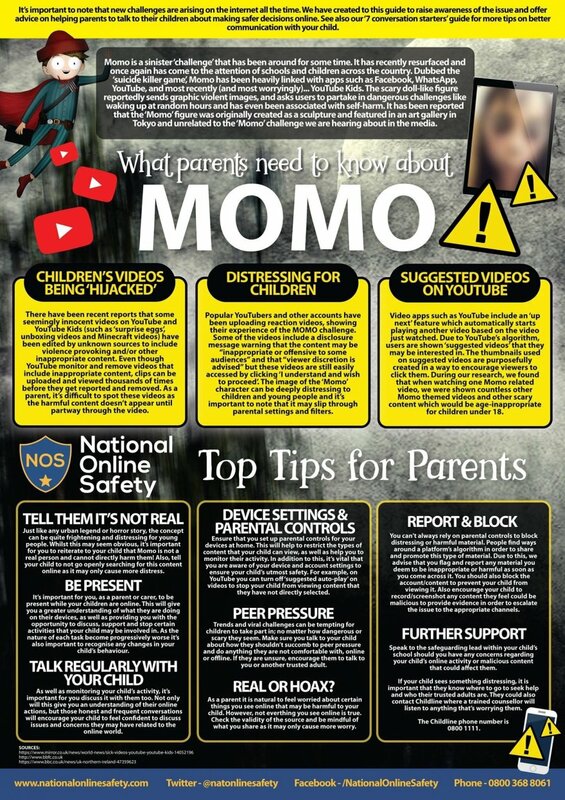 It is therefore important to talk to your children about staying safe online with your child and make sure they know that they can turn to you or speak to their teachers if they get into any difficulty. 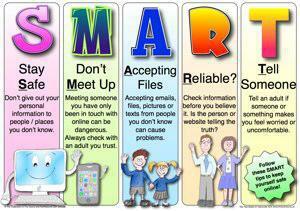 Childnetlots of useful advice for keeping yourselves and your children safe on the Internet. CEOPCEOP and Parent zone information site for you to browse. We have recently signed up for information from this site to be automatically uploaded on to our school website so that you will be able to get updated information directly from school. Watch gthis space! Bullying UKInformation and advice about bullying for children, parents and schools. KidscapeAn organisation which helps to prevent bullying and child abuse. ChildlineChildLine is the free helpline for children and young people in the UK.